The holidays are a big deal in my family. Every Christmas Eve, my parents, aunts, uncles, and cousins gather together to have dinner and exchange gifts. My family is incredibly generous when it comes to gifts, and they give extravagant presents. When I had just graduated and was living on my own as an adult for the first time, I felt the need to try to match their generosity. That wreaked havoc on my budget. I didn’t have the cash for the gifts I purchased, so I charged them on a credit card. After the holidays, I was shocked to find I had $1,200 in credit card debt that took me months to pay off. I’m certainly not the only person to go into debt over the holidays. People often focus on the material aspects of the holiday, even when they can’t afford it. In fact, it’s scarily common. But doing so can have long-lasting repercussions. Below, find out why holiday debt is so serious and what you can do now to avoid it. According to MagnifyMoney’s 2017 holiday survey, consumers racked up $1,054 in holiday debt, on average. The majority of those people put their purchases on credit cards, like I did. Worse, nearly 30% of survey respondents said they’d need five months or more to pay off their debt, including the accrued interest. That’s a problem because credit cards can have sky-high interest rates. Rates as high as 29.99% aren’t uncommon. With the high interest rates on credit cards, your holiday debt can balloon out of control. For example, if you had $1,054 in debt on a credit card with 29.99% interest and a $36 monthly payment, it would take you 139 months to pay off the debt. And you’d pay back a total of $1,819.02. Thanks to interest, you’d pay back about $800 in accrued charges. To put it another way, that sweater you bought for your grandma would nearly double in cost by the time you paid the debt off. As I found out, my holiday debt cost me in more ways than just interest fees. 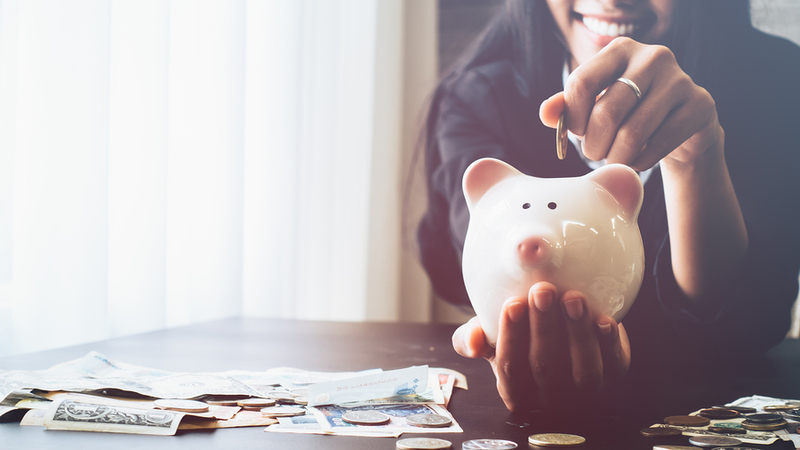 Struggling to pay off your debt can derail your goals, like paying off your student loans, building an emergency fund, or saving for retirement. To keep up with my holiday debt payments, I had to make some sacrifices in my budget. I stopped adding to my emergency fund and paused my 401(k) contributions so I could afford my monthly bills. Reflecting on that now makes me cringe. The money I would have invested in my retirement would have grown by now, but I squandered that opportunity to pay off high-interest credit cards. That’s why it’s so important to plan ahead and start saving early for the holidays. That way, you don’t have to rely on high-interest credit cards or personal loans. Trim your budget: Review your budget and look for any extras you can cut. For example, perhaps you’ll stop eating out from now until Christmas to save money. Or you can skip the Netflix subscription for a few months and borrow free DVDs from the library, instead. Small changes can add up, helping you save the money you need. Set aside money each month: If possible, set up automatic deposits into a separate holidays savings account. If you move over just a little money every payday, that can make a huge difference. Look for seasonal gigs: Many companies are hiring seasonal workers for the holidays now. You can get a part-time job on nights or weekends to earn more money. Plus, you might get a great employee discount to help you save even more on your holiday shopping. Pick up a side hustle: If you can’t commit to a regular part-time job, launching a side gig like walking dogs, babysitting, or delivering groceries can also help you boost your income in your spare time. For me, launching a side hustle and setting up automatic deposits helped prevent the shock of the holidays, money-wise. Using one or more of these tips can help you do the same, so you can enjoy the holidays without stressing out about debt.